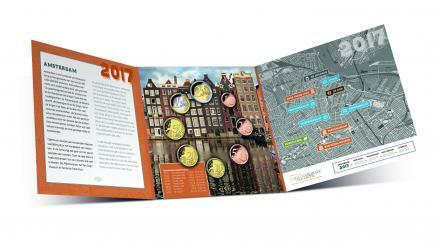 The Dutch Mint Set for 2017, with a mintage of 15,000, was released on January 24 and is already sold out on line in the Netherlands. It has all eight circulating coins: 1, 2, 5, 10, 20, and 50 cents, and the bi-metal 1 and 2 euros. ONLY THE 5 and 10 CENT COINS WILL BE PUT INTO CIRCULATION THIS YEAR. This is the first set with the theme of "Dutch Cities," and is dedicated to Amsterdam.